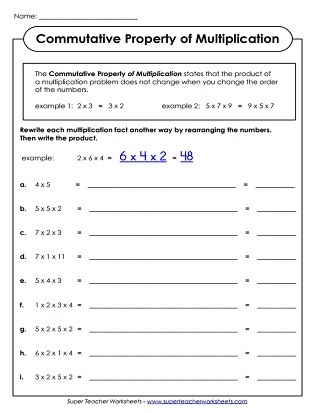 Printable worksheets for reviewing the associative, distributive, commutative, and identity properties of multiplication. According to the associative property of multiplication, it doesn't matter how the numbers in a given multiplication problem are grouped. In this worksheet, students practice grouping problems in different ways. Each problem has 3 numbers. According to the commutative property of multiplication, numbers in a multiplication problem can be in any order. In this worksheet, students rearrange the numbers in each multiplication problem, then solve. 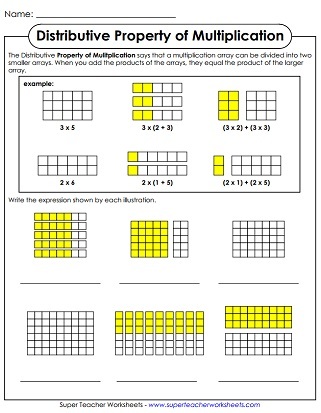 This graphical worksheet has arrays to help students visualize how the distributive property of multiplication works. Write an expression indicated by each graphical model shown. In this worksheet, students will use the distributive property of multiplication solve basic problems. Learn and practice basic facts up to 12 with these printable games, lessons, and worksheets. These worksheets have 2, 3, and 4-digit multiplication problems. Learn about the relationship between multiplication and division with these number family and number bond worksheets. Count by 2s, 3s, 4s, 5s, 6s, 7s, 8s, 9s, and 10s. Skip counting practice can help kids learn their basic multiplication facts. 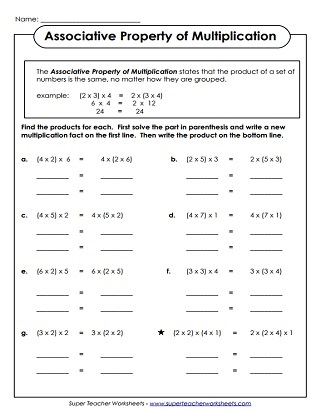 These worksheets focus on the associative & commutative properties of addition.